Ahh it's great to be a geek, the littlest things make you happy and there are always shiny new toys to make your heart go flutter. Basically imagine walking up to any pc or server connecting up your USB or eSata connection and sucking down the goodness knowing your content is RAID protected all for only $100 (not including the drives of course). 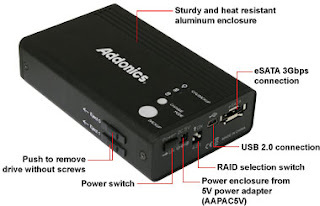 This Addonics device contains a hardware based RAID chipset so no need for drivers and can do Raid 1, (for protection) or Raid 0 (for speed). There is even an optional caddie for stacking 4 cf cards instead of the 2 x 2.5" drives for quiet SSD but with bit level protection from failure.